Performance by Stephen Varcoe, Penelope Thwaites from the CD Songs for baritone. 1 vol. of music (x, 53 p.) ; 25 cm. 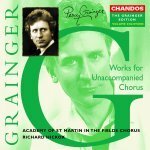 Works for unaccompanied chorus / Percy Grainger.